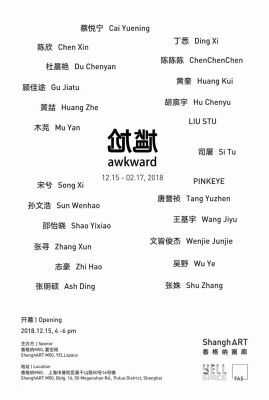 The young artists participating the first program of FAS art project in Yell Space will bring new artworkers to the 4th exhibition of the Carte Blanche program, Awkward,presented by ShanghART M50. The group exhibition is co-organised by the ShanghART M50 and the Yell Space. which will be open from December 15th, 2018 to February 17th 2019. For the first time, ShanghART M50 opens three exhibition zones inside the building atthe same time, which creates a circinate viewing route to challenge thetraditional understanding about the main exhibition room. Works from 24 artgroups will be randomly exhibited in different areas, inviting the audience toexplore a wider variety of possibilities. The exhibition title “ganga” (Awkward), which originated from Chinese south-eastern dialects with a meaning of “incomplete” or “sneaky”, gradually evolved into a common Mandarin expression. Beyond the semantic expression of its pause, buffer, transformation and adjustment, it reflects issues about capital, knowledge, authority, rebellion, and boundaries in the contemporary art world. As young artists try to pursue stable cultural identities, their art-creations are permeating with awkwardness in self-recognition. How can the new generation of artists, who are struggling at the verge of the market system, gain momentum and opportunities to take part in the ecology of the art-world. The exhibition invites artists to start with any clues from the past, and respond to one or multiple topics about the phenomena and status of “awkwardness”. Through their responses to these problems, either confrontational or adaptive, the new generation of artists attempts to reflect the current artistic environment, discusses personal identity and social relationships within the contemporary art ecology, and provides new possibilities. FAS is an experimental art project initiated by YELL Space and artists. FASis from the first three letters from the Chinese words “fasheng (happening),fasan (spreading), fasheng (voicing), fashe (transmitting),” and also Englishmeanings of “Fast, fascinate, fasten, and free art space”. Carte Blanche is an exhibition program curated by artists at ShanghART M50since 2017. The name originated from the French phrase “unlimited discretionarypower to act; unrestricted authority”, which could also be explained as “unconditionalauthority; full discretionary power; permission to do something in any way youchoose to do it”. The exhibition is like a piece of blank paper, fullyconsigned to the artists to curate or create and explore limitless possibility.